Crazy Super Fans-Extreme or Psycho? We all at one time or another or fans of someone. Whether it’s in sports, movies, even music. It’s a natural to look up to certain individuals with respect for things that they’ve done or represent. However, with everything there is an extreme. I knew I wasn't doing it right! 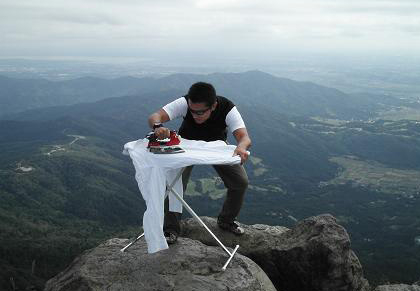 There are sports and then there is Extreme Sports. There is a makeover then there is an Extreme Makeover. There is regular old toothpaste and then there is Extreme Whitening toothpaste. Apparently we all onboard with Extreme! Yet how far is so extreme that we borderline the question of our own sanity? I think I may have that answer. Consider these extreme super fans. Ummm, there are no words. This man has 82 tattoos of Julia Roberts. The 56-year-old Chilean said he became a “fan” of Julia Roberts after seeing “Erin Brockovich” and each portrait of the actress is from scene taken from that movie. Granted the movie was good but a big part of it was that Julia Roberts was busting out cleavage and showing some thigh. So I am pretty sure he isn’t moved by her acting ability so much as how she works her assets. The next example is just weird. In fact, totally mind-boggling. I get the teen fascination with the singer Justin Bieber. He is a cute little guy that can sing and dance. And of course he is driving all the teenyboppers into a crazed hysteria. However, it’s not just teenyboppers. You can be a drug lord and still love Bieber! This is a mural that resides in a bigtime Brazilian drug lord’s living room. I kid you not! The drug lord know as Pezão is known for being one of the most notorious drug dealer in South America. During a drug bust, authorities found this gigantic mural which just goes to show no one can escape Bieber fever. Justin Bieber, you have a power no one can understand! No one can forget Chris Crocker. At Britney Spears low point in her career, Chris Crocker screamed in his YouTube video to “Leave Britney Alone”! Believe me Chris, I did! This last one is pretty cool. However I am biased! Am I just a tad jealous? I think so..
Ok so she loves Twilight! Big deal! Twilight was awesome! British “Twilight” fan Cathy Ward endured 22 hours under the needle to complete this full-back tattoo featuring Robert Pattinson and Kristen Stewart as Bella Swan and Edward Cullen. She apparently did this because she lost a large amount of weight and attributes that the books and movies helped her stay strong through her months of dieting and exercising. And she’s not done! 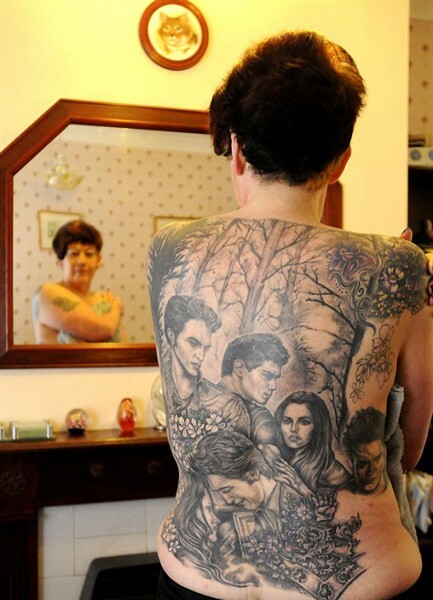 She plans on expanding her “Twilight” shrine across her entire torso. If this isn’t love, I don’t know what is! I understand that people are just showing the love of their most favorite things or people. I get that. Just with all the art decoration and displays of love, you can not forget yourself. I bet that person underneath all those tattoos is pretty special too. Even the drug lord! I bet his mama loves him! Is it too much to dedicate your entire life to loving some person in the media even giving up your body as a depiction of that “admiration”? Is it extreme or psycho? This entry was posted in Blogging, Celebrities, Comedy, Funny, Humor, Life, Opinion, Sarcasm and tagged Blogging, Craziness, Humor, Life, Not all there, Pictures make me laugh, Sarcasm, What the .... Bookmark the permalink. 4 Responses to Crazy Super Fans- Extreme or Psycho? Whoa.. Dude with the Julia Roberts tattoos is just creepy. I was googling something the other day and the chick with the twilight tattoos came up and I just sat and stared at it thinking “Are you kidding me?” To each their own I guess but some take it a bit too far and it does become Extreme and questionable….Psycho. Yeah I read about a young beautiful asian girl whose boyfriend broke up with her so in order to get him back she was going to get surgery to look like his favorite actress Jessica Alba. Jessica Alba stopped her. Thank freaking GOD! 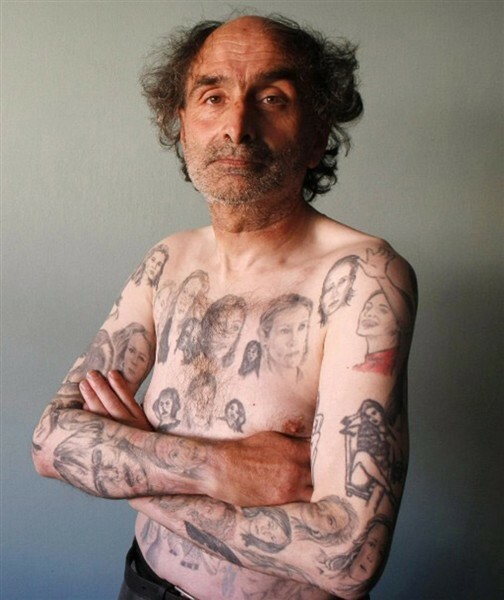 The dude with all the Julia Roberts tats, yeah, he’s definitely got some issues. I mean just look at him. He probably has posters and pictures of her all over his house (that’s not a good visual either)! Being from the Baby Boomer generation, I’m not really into tats. No matter how much I love or obsess over something, I wouldn’t go as far getting a picture of what or whom ever on my breast or leg. It’s a different mindset. I wouldn’t put a damn celebrity on my body! now a picture of my fish Henry yes!